Business English: Who’s teaching who? I’ve always had a theory that the real reason Business English is called ‘Business English’ is because the student learns English while the teacher learns a lot about business. One-to-one lessons with high-level managers are especially good for learning about different management theories, so the last 18 years of working in ELT has also been like my own personal MBA. 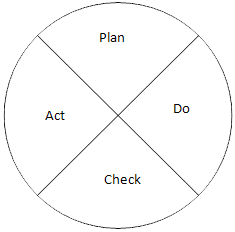 One business theory that’s always struck me as relevant to both manager and teacher is the Deming Cycle. Deming is probably most famous for his work on quality and TQM, but his ‘cycle’, which defines the process of management, is still massively influential on basic management training and certainly applies to what English teachers do in the classroom. Managers plan a project including the stages, who will do each stage and by when etc. Then this is put into action in the ‘Do’ stage. Both during and afterwards, the stages, or the entire project, are checked and then it can be evaluated. Based on this evaluation, the manager takes necessary action and begins planning again. Clearly, this cycle can be easily applied to the classroom. We plan a lesson, do it, check our students’ progress and follow up with necessary action. As with management, failure to implement any one of the four stages in the lesson cycle can often explain why lessons go wrong. Having trained and observed many teachers on courses, my impression is that most problems occur at the ‘Check’ and ‘Act’ stages. The reason is that during the ‘Do’ stage, the teacher hasn’t incorporated enough tasks which will demonstrate outcomes and produce tangible results which will allow us to be able to check or evaluate and give useful feedback to act on. In Business English classes in particular this is especially important as our students (and companies) want measurable successes. Without these last two stages, students will be left wondering what the point of the lesson was. As you listen to the student, you tick each stage if it is done successfully. As students become familiar with this format they can even use the checklist to evaluate each other. So next time you reflect on your lesson, apply Deming’s cycle and see if you can identify the four stages of the cycle in action.